Eusebio Di Francesco has dismissed any lingering questions over Lionel Messi’s fitness and wants Roma to restrict him again in the second leg of their Champions League quarter-final against Barcelona. Messi missed Argentina’s two friendlies last month with a hamstring injury and was only a substitute in Barca’s 2-2 draw against Sevilla on March 31, but he was back in the starting line-up for the 4-1 victory over Roma atA-old was not among the goals in the first leg but hit a hat-trick in a 3-1 win against Leganes on Saturday, Ernesto Valverde opting against resting the superstar. Di Francesco felt Messi’s latest display proves how effective Roma were in keeping him quiet and wants a repeat at the Stadio Olimpico on Tuesday. “Everyone was saying he wasn’t fit and suddenly he scored a hat-trick,” the Roma coach told a pre-match news conference. “This means we managed to limit his movement between the lines. We have to reduce the space around him as much as possible, wherever he pops up on the pitch. “Barcelona’s strength comes from their mentality, which starts from the youth academy and has been built up over the years. They manage games superbly, using the ball well and making few mistakes. “We forced them into errors in the first leg, but we didn’t take advantage of it. On the other hand, we paid dearly for our mistakes. We want to control the game but not concede.”Eusebio Di Francesco has dismissed any lingering questions over Lionel Messi’s fitness and wants Roma to restrict him again in the second leg of their Champions League quarter-final against Barcelona. Messi missed Argentina’s two friendlies last month with a hamstring injury and was only a substitute in Barca’s 2-2 draw against Sevilla on March 31, but he was back in the starting line-up for the 4-1 victory over Roma at Camp Nou last Wednesday. The 30-year-old was not among the goals in the first leg but hit a hat-trick in a 3-1 win against Leganes on Saturday, Ernesto Valverde opting against resting the superstar. 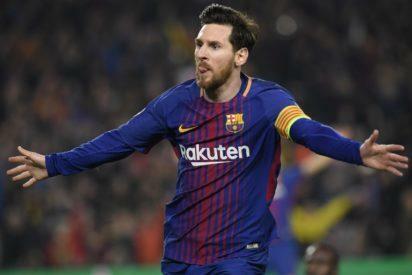 The post Messi is fit as fiddle, Roma coach warns appeared first on Vanguard News.